America has not failed us. We have failed America. “America” represents a set of ideals, a set of values organized into a polity and a promise. The thing about ideals and values is that we either live beneath them or we live up to them. What’s broken in the country is not the values and ideals, but the people who espouse but fail them. Last night Americans failed America. We saw an American prosecutor fail the principle of “blind justice” by handling court procedure in a way most legal experts found a dereliction of duty. Over and over again we heard that the grand jury bar for an indictment is so low all it takes is a ham sandwich. Prosecutors who want to prosecute don’t “present all the evidence;” apparently, they present only that evidence that gets them the indictment and commences the trial. If that’s true, and I have to trust the majority opinion of legal experts since I’m not one, then Ferguson’s prosecutor failed to even live up to the low-bar ideals of his profession, much less America. Shortly after President Obama took the podium, speaking from the bastion of American ideals and principles to all American people. Television broadcasts flashed the jarring juxtaposition of a President calling for peaceful demonstrations while tear gas canisters flew and angry protestors began the night’s destruction. President Obama began exactly where he should have: by reminding us that America is a country under the rule of law. It’s good for us to remember and respect that, the alternative played out in places like Syria and Iraq and the Sudan is too disastrous to entertain. The problem with Mr. Obama’s comments wasn’t the beginning, but the conclusion. With what did “the highest office in the land” leave us, but a few general admissions that “there is a problem” and an unhelpful rebuke aimed at media about riots making “good television.” In times of crisis our leaders must lead. That, too, is an ideal too many of us have not lived up to. The fact that the situation is difficult does not absolve us of leadership responsibility; rather, it heightens it. 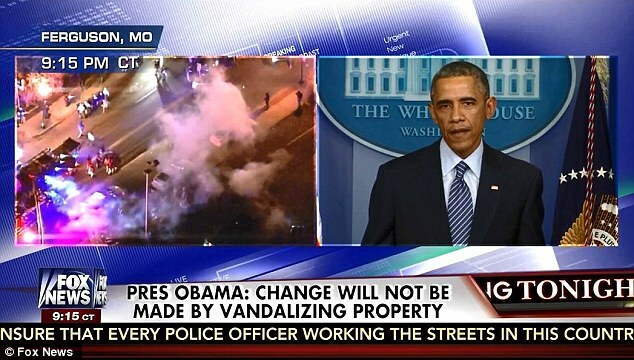 Then there were those people in the Ferguson crowds who rioted. They, too, betrayed their own calls for justice as they fell well beneath the ideals of a country that protects civic protest as a right. A just cause may be destroyed by the use of unjust means. Watts, L.A., Harlem and D.C. still teaches us that burning down the communities in which you live can soothe unrestrained anger but it can’t produce justice. Those who live by the sword die by the sword. If anyone wanted to honor the life of Michael Brown and a lengthening list of others killed by police officers in suspect circumstances, they failed that ideal the moment the first match was lit or window broken. And here we stand amidst smoldering flames, armored vehicles, television lights. Almost everyone angry–whether it’s the anger of riots in the streets or the quiet riot of the human heart. The question still remains: How shall those who believe in and love the country’s ideals respond? Three broad courses are possible, only one righteous. We may turn the television and turn our heads and continue the unusual business of business as usual. It’s an unusual business for anyone who claims to believe in American ideals, especially those who believe those national ideas at least resonate with deeper biblical ideals. Indifference is no option for the righteous. Or, we may declare the matter resolved and proclaim from the burning rooftops, “The system worked.” It seems to me any robust measure of “the system” must include more than the verdict reached, but must also take an accounting of fair process and even the system’s response to its verdict. Even if we think everything happened as it should, that doesn’t mean our work is done. For that system needs nurturing and strengthening. It needs explication, inculcation, and protection. Our civic ideals require we remain involved in an open, honest discussion about what worked and what didn’t so that what we cherish isn’t slowly eroded by our inattention. That inattention is no option for the righteous, either. In this instance, I am a firm believer that Lady Justice miscarried. She lost the baby of righteousness in the first trimester, in the 100 days it took a grand jury to fail to find “probable cause” and the one hour it took a prosecutor to mutter his way through chastising television and social media on the way to prosecuting the evidence. Nothing about this situation seems just to me–from what we know of the shooting itself to last night’s verdict and riots. Nothing, except that we do have a legal framework and process and officials in that process sworn to uphold justice. This means that from the miscarriage life may still spring. There’s recourse–even if historically it hasn’t always been offered to African Americans. There’s a way to honor our best ideals and to seek the elimination of similar situations, to seek a more life-protecting and just society, especially from its elected and commissioned officers. What would that look like? Here are my first thoughts, admittedly offered in the groggy fog of a long night watching everything happen that should not happen. Feeling that strange sense of disbelief while knowing this would be the outcome. Here’s how I wish the President had ended his comments and what I pray the remaining movement in Ferguson, New York, LA and other parts of the country would commit itself to. Forming a National Commission for Reviewing the Use of Deadly Force by Police Authorities. The aim of the commission would be to form a panel to (1) review the common factors leading to the deaths of unarmed persons in confrontation with or custody of police authorities; (2) review the grand jury process for ways to improve the representation of victims and further inform deliberations with juror legal education; (3) review definitions of imminent threat to officers and probable cause in grand juries; and (4) recommend effective community relationship and policing strategies with special focus on serving communities disproportionately detained, arrested, incarcerated and injured/killed in police interactions. There really is no excuse why such a commission could not be formed today. The President could make this happen with another press conference and stroke of the pen. It’s no fix-all remedy. But the use of body cameras have been shown to improve interactions between officers and the persons they police. The technology is inexpensive and non-invasive. The Federal Government should require and fund the use of such cameras immediately. According to most accounts, a grand jury indictment depends largely on the recommendation of the prosecutor. If he/she wants an indictment, they tend to get one. They present the parts of the evidence that lead to the conclusion. In this case, a prosecutor with a history of close affiliation with police officers and no record for ever bringing an indictment, “rigged the system,” according to one analyst, to get the result he wanted. He took the unprecedented steps of giving the grand jury “all the evidence” and allowing the accused to testify to the grand jury for hours instead of leading a prosecutorial effort with integrity. In this case, justice may have been served better by the prosecutor recusing himself, or, failing that, granting the aggrieved the opportunity to appoint a prosecutor better suited to lead the process. There needs to be a review of this part of the judicial process given the pivotal roles prosecutors play. There should be an ability to supplant a prosecutor suspected of conflicts of interest with an independent prosecutor. In a country that cherishes the rule of law, there’s no good reason for small town police departments to be stocked with military surplus equipment–equipments whose sole use is the lethal restraint of enemy combatants. Ferguson is not Iraq. The African-American residents there are not ISIS militants beheading civilians. The possession and use of this equipment is immoral, unjust and provocative. Police departments have successfully quieted riots and looters without such equipment for decades now. In cases where more personnel and equipment are needed, the National Guard should be mobilized. The Federal Government should immediately remove weapons and vehicles from local departments where officers have zero training in its proper use. I am no politician or elected official. I’ve been around public policy enough to know that it’s no cure-all. I’m not misplacing my hope. I have no sense that doing these things will fix everything or usher in the kingdom of God. But this I do know: There is no way people of good conscience or people of Christian faith can look at the events in Ferguson and conclude there’s nothing left for us to do or nothing that can be done. No, both pure religion and good citizenship require we not settle for what’s happened in the shooting of Michael Brown and the aftermath of the grand jury’s decision. The Ferguson grand jury has given us our marching orders. They have ordered us to march for a more just system of policing and the protection of all life. We are obligated–if we love Christ or love this country–to find a way forward to justice, a way suitable to the dictates of our individual consciences and the word of God. Perhaps you don’t agree with my feeble recommendations above. Great! That’s freedom in action. Now propose something better and let’s get to work. How Deep the Root of Racism?